In what is being suspected as an operation of trafficking illegal immigrants into the United States came to a deadly end. 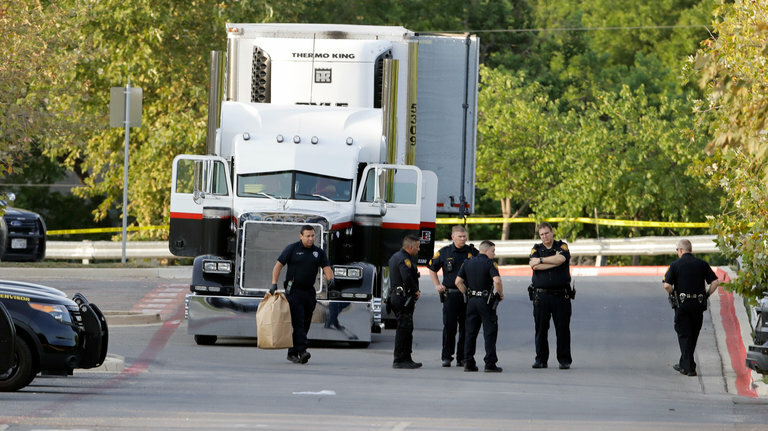 Authorities discovered at least 8 people dead in the back of a semi truck's trailer. This is said to have happened in a Wallmart parking lot in San Antonio, Texas. Fire fighters were called around 12 A.M Sunday and they are said to have made the discovery. ICE (Immigration and Customs Enforcement) were called to the scene as well as police. This is truly a horrific human trafficking case and it has been reported that police have arrested the driver. The police say that they found dozens of people in the truck and that there was no air conditioning despite the extremely hot temperatures. The San Antonio Fire Department said that 8 people died. “They were very hot to the touch. So these people were in this trailer without any signs of any type of water,” Charles Hood who is a San Antonio Fire Chief said. “We are very fortunate that there weren’t 38 people who were locked inside of this vehicle dead,” He mentioned. 38 people is a staggering amount of people to be put inside of a trailer that does not have air conditioning. The temperature in the trailer would have been hot no matter what but it was even hotter with 38 people inside. “They were very hot to the touch. So these people were in this trailer without any signs of any type of water,” The Fire Cheif said. The people are also said to have been suffering from dehydration and stroke injuries. William McManus who is a police chief mentioned that the trailer looked to be part of a smuggling operation and that the people involved would be reviewed by ICE. We’re looking at a human trafficking crime this evening,” He said. “a horrific tragedy,” McManus said. It was reported that he also mentioned that the driver of the truck was arrested. It was later reported that another 2 people have died. This brings the death toll to 10 people.